And so, dear readers, we have moved again. From Tennessee where so many life events (some good, and some bad,) have come and gone, the winds of change have filled our sails once again and we have embarked on a new journey. This time lady fortune has lured us further Westward to the foothills of the San Gabriel Mountains, just east of The City of Angels. Had you asked me in June, I would never have guessed that we would end up living in Greater Los Angeles. But here we are, with a new home, and new jobs, getting back into the swing of things. Its a new swing but it has a nice groove; and with my penchant for produce, I could certainly do much worse than to end up in LA. Though we were sad to leave behind our phenomenal CSA program in Tennessee, we are so fortunate to have moved to an area where high-quality farmers markets are abundant. We have tried three of the area’s local markets so far and have been overwhelmingly impressed by the variety of local ingredients and handmade goods. The knowledge and passion of the vendors and artisans gives the market its buzz and verve. Fruit vendors proudly pass out samples of their home grown produce and will gladly spend time with conscious consumers to explain their growing practices. Artisans offer up color on the inspiration for their wares which vary from market to market but include an immense variety of goods from beautiful handmade soaps, to aged balsamic vinegar, to home dried fruits, freshly popped kettle corn, local honey, and a multitude of baked goods. These are the markets I have been longing for – and with the scent of sweet summer fruit in the air and passion emanating from each booth, inspiration abounds. Now in its 13th year, The South Pasadena Farmers Market has a strong reputation as one of the best in Greater Los Angeles. Situated smack dab in the middle of what is arguably one of the most picture-perfect towns in the local area, the farmers market buzzes with activity every Thursday evening. The sense of community is immensely strong at this evening market. Parents bring their children to participate in sing-a-longs led by a local musician. Food stalls serve up dinner to hungry shoppers who set themselves down at communal picnic tables to enjoy their feast “en plein air.” Produce purveyors banter with their regulars while welcoming newcomers into the fold proffering up wedges of nectarines and samples of fresh pea pods for old and new shoppers alike, whetting their appetite for the weeks peak produce. 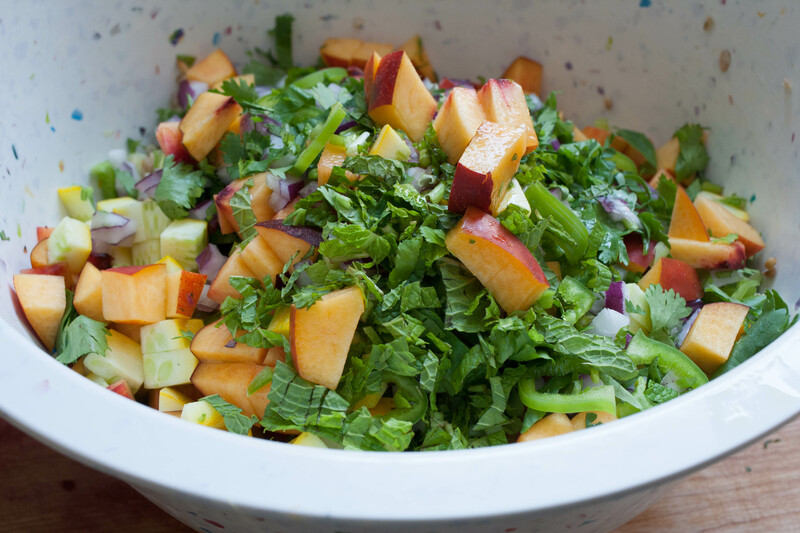 It was one such sample of a tangy golden nectarine that seeded the inspiration for this salad. Only a stones throw from Georgia, we were plenty fortunate in Tennessee to be on the receiving end of the region’s well renown peaches. But despite Georgia’s claims of dominance in the production of peaches, I have been overwhelmingly impressed by the variety and quality of stone fruit for sale at the Pasadena Area’s farmers markets. To preserve their delicate flesh from bruising, most peaches, plums, and nectarines are picked, packed, and taken to market just a day or so before they fully ripen. Though I have traditionally found underripe fruits to be unpleasantly tart, or lacking in flavor, some of the semi-firm nectarines offered up for sample struck a cord. Tangy but sweet, firm but not crunchy, the nectarine shows a different color and new versatility when eaten just before it reaches the pinnacle of ripeness. 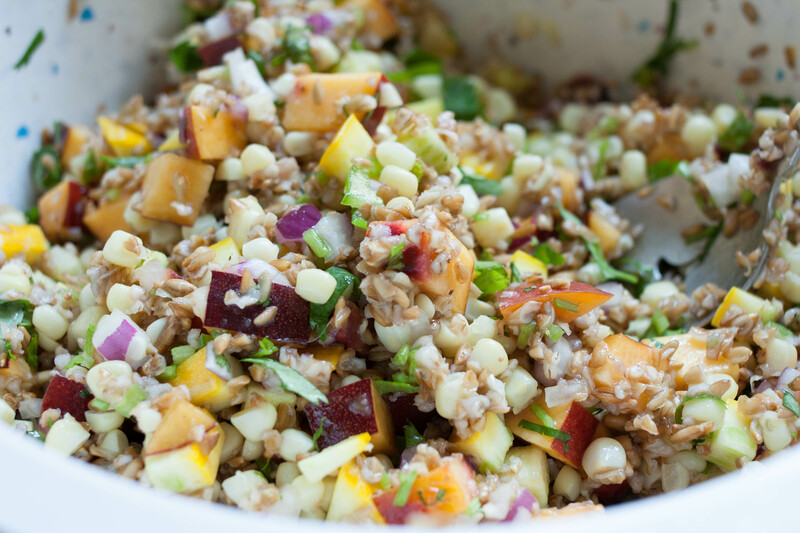 In this salad that sweet yet tart flavor plays well with the zesty chiles, sweet summer corn, and punchy onion; and the fruit brings a citrusy brightness acting as a foil for the earthy rye berries that make up the bulk of this grain-based dish. The original recipe called for cucumbers but I have adapted it here to include some lovely golden zucchini in its stead. As we typically prepare dishes for Dustin’s packed lunches in advance, I wanted to use a vegetable that would keep well in the salad for a few days and not leach too much water into the dish, hence the swapping in of zucchini for cucumbers. 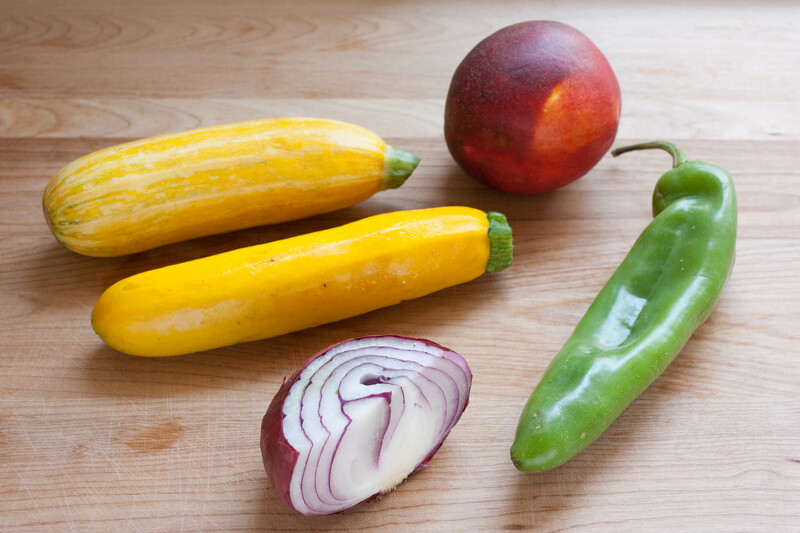 For similar reasons, I would strongly suggest using a golden zucchini over a yellow summer squash. If you cannot find golden zucchini at your local market, feel free to substitute a the traditional green variety that is so insanely abundant during the summer season. From place to place, vendor to vendor, and varietal to varietal, I find there is so much variance in corn. Some summer corn is so sweet and tender that I will happily eat it “raw,” cut straight from the cob (or perhaps still on it.) If you are lucky enough to happen upon corn that is brilliant in its naked state, simply remove it from the cob and add it to the salad uncooked. 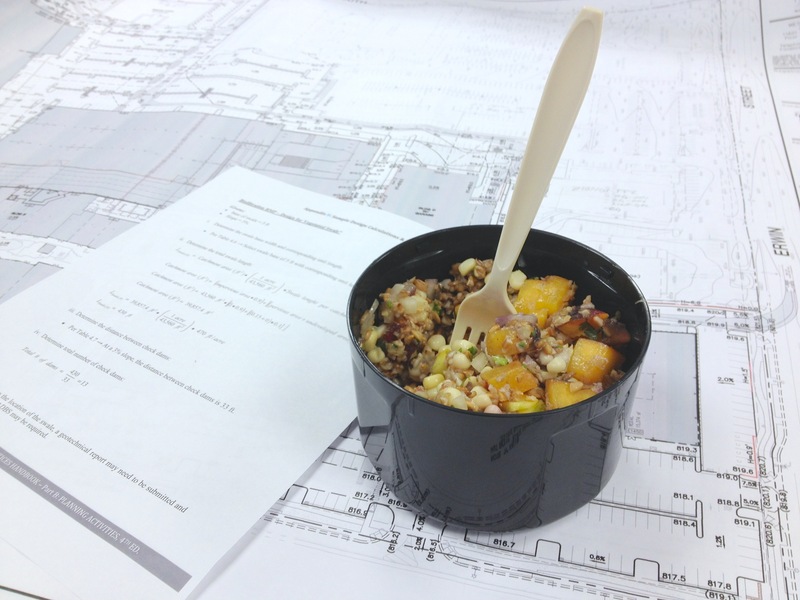 At times I find corn to be too starchy to eat without at least some cooking. There are countless ways to cook corn and virtually all will work for this dish. If you happen to be lighting up the grill you can simply wrap the shucked corn in foil and let them steam in the foil for a 10 – 15 minutes, or until the kernels darken ever so slightly in color and become tender allow the corn to cool before severing the kernels from the cob. Another method I like involves removing the kernels from the cob and briefly blanching these in boiling water. Once the water has returned to a boil, leave kernels to bubble away for about two minutes before removing them with a slotted spoon to a prepared ice bath. The ice bath will halt the cooking process and brighten the color of the corn slightly. 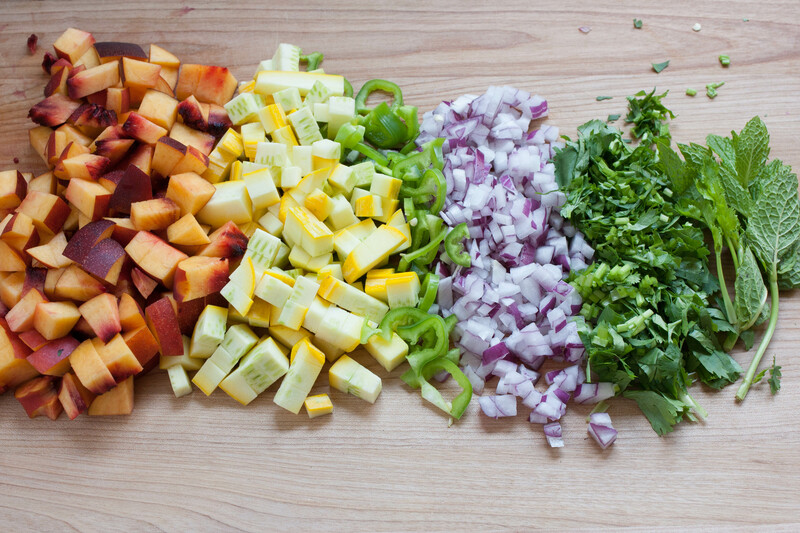 If using this method, allow the kernels to drain well before adding them to the salad. In a medium saucepan (with a lid) bring 3 cups of water to a boil. While the water is coming to a boil, place the cracked rye in a fine mesh strainer. Rinse the rye in several “changes” of water, as you would rice before cooking. Once the water has boiled add a pinch of salt and the grains. Once the pot has returned to a boil, place the lid on the pot and remove it from the heat. Let it stand for at least 5 minutes before removing the lid and tasting one of the grains. The grains should no longer be crunchy but should still have a somewhat firm texture. If they are not soft enough, return the lid to the pot and let stand several more minutes before testing again. Once the grains are to your liking, drain in a fine mesh colander and rinse with cool water to stop the cooking process. Give the colander a few shakes to rid it of some of the excess water and leave the grains to drain while you prepare the remaining ingredients. 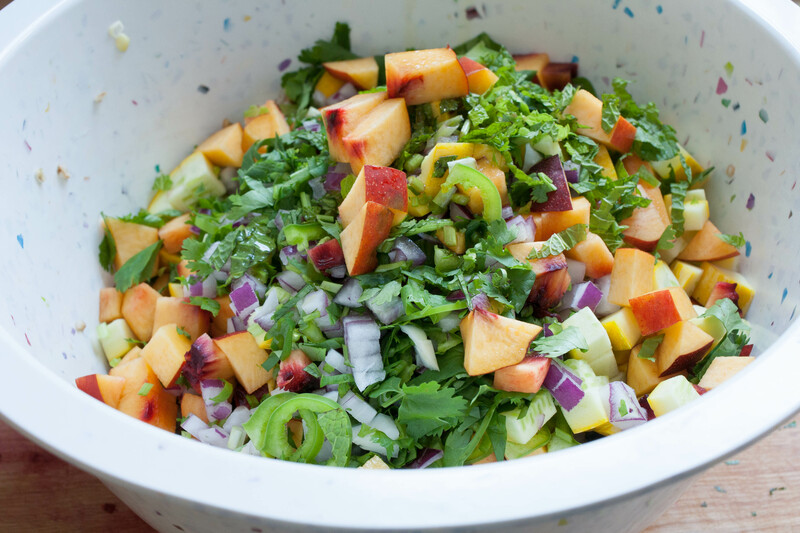 Place corn, nectarines, onion, zucchini, and chiles in a large bowl and toss to combine. Add cilantro, mint, lemon juice, sherry, agave, olive oil, a liberal pinch of salt and several cracks of pepper and toss again. Add the well drained rye berries and stir to combine. 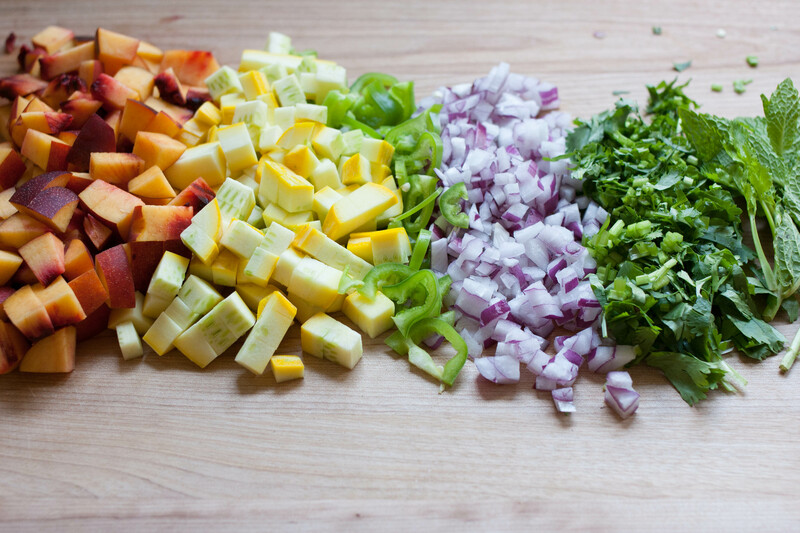 Taste for seasoning and adjust to your liking with salt, pepper, lemon juice, and olive oil.